The PRO6.4E is designed for professionals and quality-minded home owners. Its durability and reliability comes from heavy-duty components, proven design and the KOHLER Command PRO engine. Clean power runs appliances and tools safely at your home or jobsite. Auto-idle down increase fuel efficiency and lowers noise. It operates 15-hours on a tank of gasoline at 50% load. Comes standard with folding handles, all-terrain tire kit and a cord wrap kit. OSHA and CARB compliant. 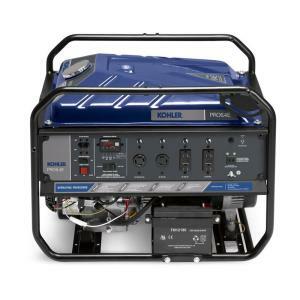 Tbook.com crawls the web to find the best prices and availability on Generators and related Tools and Hardware products like Kohler 6,400-Watt Gasoline Powered Electric Start Portable Generator with Command PRO Commercial Engine. For this page, related items include products we find that match the following keywords: "Generator GENERATOR" at our vendor partner Home Depot. Kohler 6,400-Watt Gasoline Powered Electric Start Portable Generator with Command PRO Commercial Engine is one of 152 Generators and related products listed in the Tools and Hardware section of Tbook.com If you have any questions on this product, please give us a call at 734-971-1210 during the hours of 9am - 5pm EST for assistance. Thank you for shopping at Tbook.com, the Internet Department Store!